The secret behind differentiating a pro golf player from the amateurs lies in the swing. These golf accuracy aids help players develop a keen sense of direction when putting which also serves to improve a player’s accuracy and speed. Golfers can all agree that it is difficult to achieve the perfect golf swing which is why Izzo Smooth Swing aims to provide players the help they need to develop the swing by keeping the player’s body and arms together for a more efficient swing. This improves on the distance and accuracy that the ball can go. The Ball-First Trainer mat is designed to perfect your swing accuracy, consistency, and power. Improves ball striking consistency and precision, which are necessary to maximize distance and accuracy with iron shots. The mat encourages a proper lag, a downward strike, and a square clubface at impact. Use the markers on the mat for comparison analysis of divots to original ball placement. This tool is great when it comes to improving a player’s putting by forcing them to aim and hit the ball at the hole’s high side. IT also helps players develop a keen sense of direction when putting which also serves to improve a player’s accuracy and speed. A truly wonderful tool to improve on one’s putting skills. Learn the feel of the correct clubface impact with the SKLZ Rick Smith Smash Bag. An ideal training tool for the beginning and intermediate golfer, the Smash Bag provides visual feedback on the quality and accuracy of impact. All you have to do is line up and swing, then take a look at the angle of the proprietary target map to see how you did. Lightweight, portable golf stance alignment aid helps ensure consistently square alignment, correct ball position, and proper distance from the ball for every club. Eliminate your golf swing faults before they start. The multi-use Practice ImageLink Pro aids in body position, orientation and direction of your golf swing. The three-rod system helps you learn to set up squarely, as well as hit draws and fades. The included shoulder alignment mirror helps you self-monitor proper shoulder positioning. The Pure Path gives you honest feedback on your golf swing and helps eliminate slices and hooks to hit longer and straighter. Learn the perfect golf swing. Take the practice range anywhere and never run out of golf balls. Hit with any wood, iron or wedge. Helps correct pushes, pulls, slices and hooks. Gives immediate feedback on swing path. Quick, easy assembly and setup, stakes right into the ground, with no practice net needed. Real ball for true feel with sturdy construction. Dual-Adjustable Hinged Training Club. Breaks in the Refiner show breakdowns in your swing. The patented, two-way adjustable hinged clubs give instant feedback on tempo and swing plane to smooth out your swing. Even hit balls with it. Adjustable hinged driver for immediately analyzing the flaws in your swing. Patented, 2-way, adjustable hinge delivers instant feedback on tempo and swing plane. Promotes better overall ball contact to produce longer, straighter shots. Patented see-through grip graphics encourage ideal hand placement. Hits balls on the range; includes adjustment key/divot tool. The Refiner Pro Graphite is the only graphite training club available anywhere, and provides a more accurate swing weight and the feel of a real driver. Engineered to hit golf balls and teach a smooth, even-tempo golf swing, the patented two-way adjustable- hinged club exposes swing flaws immediately by a break in the hinge. The dual-colored shaft gives visible cues for maintaining an on-plane swing path, and the grip provides ideal hand placement guides in order to square the clubface. Get rid of that golf slice or hook for good. The adjustable guide pads of the Slice Eliminator encourage a correct in-to-in golf swing path for straight shots, and give immediate feedback on an out-to-in and inside out swing path. A simple, yet effective training aid that should be brought to the range whenever you're hitting bananas. The secret behind differentiating a pro golf player from the amateurs lies in the swing. That is why swingyde aids any player from all levels to improve on their golf swings which adds to the distance and accuracy of the ball when hit. It also very easily attaches to the shaft of the golf club. New Dynamics Golf Swing Glove Large MLH Training Aid. We carry all sizes. Quantities at a discount. 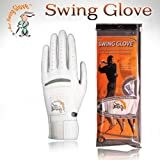 In Practice and Play - The Swing Glove Helps You Achieve a Consistent Swing for Lower Scores!• Every golfer knows it can take years of practice to achieve and maintain a consistent swing. Unlike other training aids, the Swing Glove improves your game while you play. The Swing Glove, made of premium Cabretta leather, is a revolutionary golf glove with a hinged-plate wrist guide designed to ensure your entire swing remains perfectly balanced. The Swing Glove's patented Swing Gear technology is an innovative hinged-plate that keeps your wrists and hands in proper position through the entire swing. Top instructors agree that a softer grip on the club delivers more power than a grip that is too strong. The Swing Glove enables this softer grip allowing the hinged-plate to better guide your wrists, and helps reduce any excessive pressure caused as the Swing Glove works to correct your wrist position.